Duke's is a fun place to share a game with new friends! My husband and I are Americans and had been visiting Phuket since 2004. October 2009 we made Phuket our home! We took back the rental villa we built between Surin and Bangtao and said goodbye to corporate life and we're now executing on our dreams. While I love living on the north end of the island because it's less commercialized, I find Kata to be one of the best little spots for vacationers. It's just a cozy little place with enough action. Completely unlike the tourist mess of Patong....most agree, once is enough. One of the best things about Kata...the visitors just keep coming back and every nationality is represented. Many of our customers tell us how little Kata has really changed over the years and that keeps the regulars coming year after year. After a several month search, we found an ideal little location and built a small sports bar with 20 seats and 5 big screen TVs....yep, we settled on Kata. 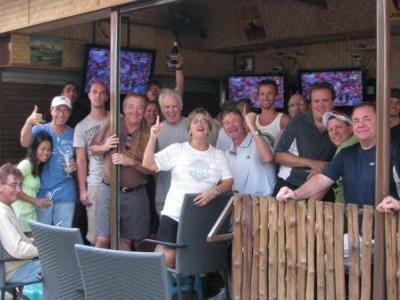 If you're visiting or live in Phuket, stop by Duke's Sports Bar @ Kata Beach. No matter what, put Kata on your travel plans when in Phuket. The owners of Dukes Sports Bar have retired a couple of years ago and unfortunately Dukes is now closed. Comments for Kata's a great comfortable small town & 5 minutes to the beach. Thailand is an amazing country for visiting purpose as it is covered by natural beauty and scenes that makes people mind fresher and also put a positive impact on their health. Phuket is one of the most famous points in Thailand that can also be regarded as a paradise on earth. Hi Karen, we all envy you and Kata is a great location, we look forward to catching up when the next big game is on.